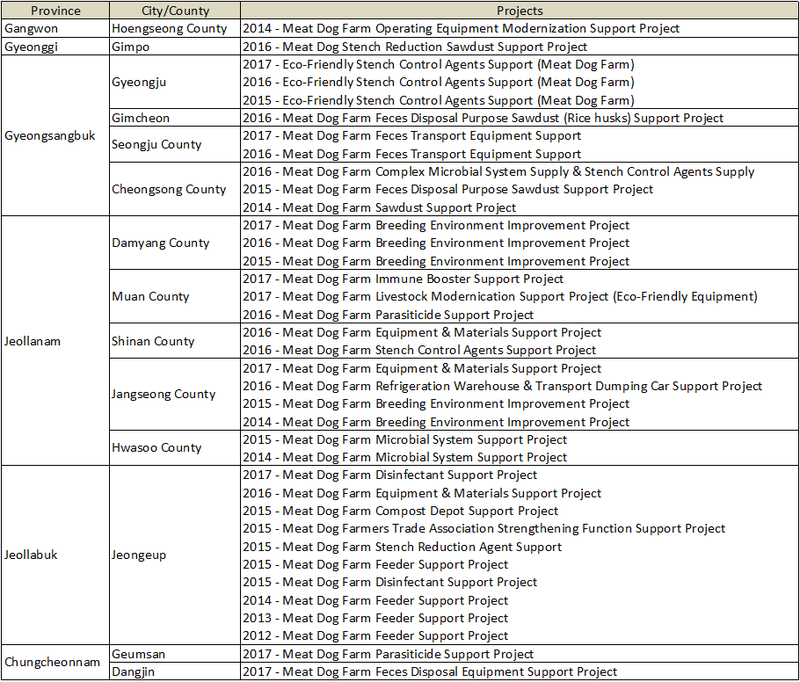 Home / Blog / Korean local governments are using taxes from their citizens to support meat dog farms. Are they out of their minds? This is translation of post from Korea Animal Rights Advocates (KARA) on 7/6/2017. Click HERE for KARA’s post in Korean. We strongly condemn the local governments that support dog meat farms! Whenever the problems with dog meat farms are raised, the Korean government – at federal and local levels – have always made excuses that there’s nothing they can do because dog farms are not regulated under the “Livestock Products Sanitary Control Act”. Therefore, the majority of Koreans, along with animal protection groups, have long criticized the government for ignoring the issue of dog meat farms. However, there is an error in the criticism they’ve received so far. It isn’t that the government was ignoring the issue; it has been revealed that they have been actively supporting dog meat farms. The dog meat industry is a declining industry due to the decline in demand. However, the government has been acting like an artificial respirator to prolong their life, not only helping them through neglect but by actively supporting the industry. We are outraged and strongly condemn the actions of the municipal governments that have used taxpayer money to support dog meat farms. We have discovered that Gimcheon (Gyeongsangbuk Province), Jangseong County(Jeollanam Province), Jeongeup (Jeollabuk Province), Gimpo (Gyeonggi Province), Hoengseong County (Gangwon Province), and Geumsan County (Chungcheongnam Province), among others, have been supporting dog meat farms by providing disinfectant, vaccination medications, immune system enhancers, parasiticide, sawdust, stench reduction, manure handling equipment, and animal feed. These governments have been supporting the dog meat farms under a variety of names such as “Livestock Production Environment Improvement Projects,” “Livestock Stable Improvement Projects,” “Meat Dog Farm Operating Equipment Modernization Support Project,” and more. There was even a local government that supplied “refrigeration warehouse” to the dog meat farms. Moreover, we were able to confirm that some local governments gave special treatment to members of the trade associations, such as the Korean Meat Dog Farmers Association, by limiting their support only to these members. They even provided special support to these group members through the “Strengthening Function of OO Trade Association Project”. The government claims that the management and control of dog meat farms is difficult due to the lack of pertinent laws and regulations, yet despite the lack they have been able to support the industry. Are dog meat farms in Korea special privileged groups that are exempt from any responsibilities? In a previous KARA survey, the average number of dogs on a dog meat farm was 273. However, the farms in the Jeollanam and Jeollabuk Provinces averaged 322.5 and 304.7 dogs respectively, taking 2nd and 3rd place nationwide for the highest number of dogs per farm. There are 77 dog meat farms in the country that operate in a large factory-like facility with more than 1,000 dogs per farm, and Jeongeup in Jeollabuk Province alone has 9 such farms, accounting for 11.7% of the total. We do not believe that South Korea, as the only nation in the world where dogs are farmed for meat, is able to expand dog farms by corporatization without the support and aid of local governments. In fact, there were many more dog meat farms in localities such as Jeongeup and Muan County, where the government frequently supported dog farms, compared to other cities/counties within the province. Dog meat is now a relic of a once-bleak society that is slowly starting to lose ground. How much longer should such a tradition, once the only option available when the we survived on tree roots and bark and dreamed of eating rice with meat soup, be glorified? Those who support the consumption of dog meat use the so-called “Dog Meat Nationalism” cultural relativism argument. This infantile logic that protecting the dog meat industry elevates national pride is, however, only met with ridicule even within our country. To pour taxpayer money into the dog meat industry is not a preservation of culture or tradition; it is the perpetuation of a deep-rooted evil that is neither historically accurate nor appropriate for the times. On the outside, the government pretends to be neutral regarding the dog meat issue and acts like they are listening to arguments from both sides. However, the financial and material support secretly offered to the dog meat industry shows their two-faced unethical abuse of power. In April, Taiwan passed an amendment to their Animal Protection Act banning dog and cat meat. Even in South Korea, local governments are following the lead of Seongnam and Seoul to actively try to end the dog meat industry. Thus, ending the consumption of dog meat globally is forward movement and the mission of our time. Korean local governments that support the meat dog farms (South Korea is the only nation in the world where dogs are farmed for meat) is the shame of Korea as well as a blight that must be eradicated immediately. 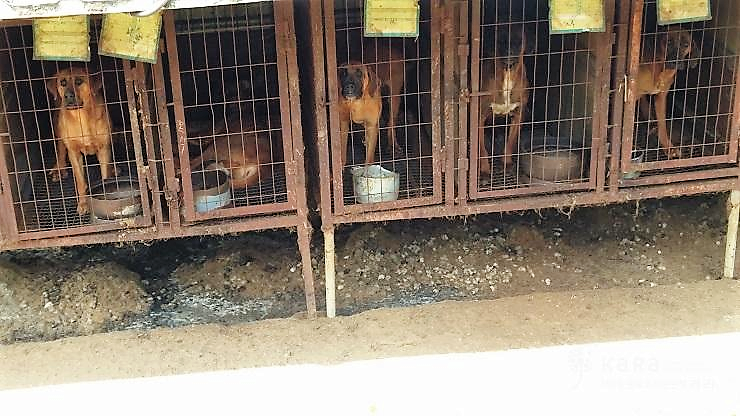 We strongly demand that the local governments of South Korea immediately stop using taxpayer money to extend the life of meat dog farms, a shameful and declining industry. If the livelihoods of dog meat farmers are truly of concern, the right thing to do is to shut down the horrific dog meat industry and help them find a new livelihood as soon as possible. Also, if you have money to fill the pockets of dog meat farmers, then use that money to change and implement the policies to save lives of meat dogs that live and die in utter misery. it is corruption. I’m sure.